This page is very stark and clean, with a Retro-Victorian feel. A standard 2-column blog format makes navigation easy. This page is apparently aimed at the intelligentsia. Those who would take “you are not so smart” to be an entertaining challenge rather than a threat. Entertainment and edification of the masses. An additional goal is now to sell copies of the book that has been spawned from the site. 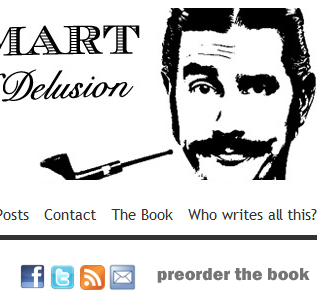 There is a social media bar, with links for email and book ordering on all pages. Web site is a WordPress blog (view source) and has an RSS feed. The site also uses PHP.